A daily chore for parish priests is opening assorted envelopes that arrive in the post each day, taking one look at the contents, and throwing them and the envelope in the bin. I have one of those big square "stack 'n store" boxes next to the desk since they can take more reams of paper before you have to empty it. To be honest, I look forward to the postal strikes. Occasionally there is an item worth at least reading. The other day a flyer arrived for a new CD "Alma Mater. 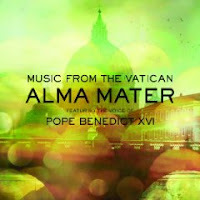 Music from the Vatican". To be honest, years spent in Rome meant that the promise of "Music from the Vatican" didn't really get me rushing for my credit card - but it did say that it featured the voice of the Holy Father and this gave me pause for thought. Not a long pause: after a few seconds, I decided that it might well be just a bit of exploitation of the Holy Father to sell a mediocre CD. The Catholic Church may have abolished the Inquisition, but it still knows the meaning of torture. See: How dare they subject Pope Benedict to this musical atrocity?.